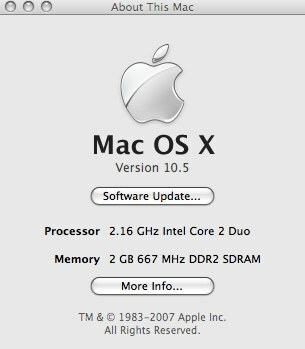 So today was mostly spent upgrading the iMac to Leopard. All went well. In fact it was relatively painless which is more than can be said for my calf which I’ve aggravated again just walking about town. I don’t think I mentioned this but I tore my calf last week playing badminton. 10 days later and it’s still sore(r) but then I knew it would take a while to heal properly. Anyway, this was supposed to be a Leopard post. Well I’ve not really had chance to play with it much so I’ll get the laptop done tomorrow and then take a few days to mull over what has changed. It ain’t all good you know! Totally agree with John Gruber that not releasing the GM of Leopard to dev’s is a really bad decision from Apple. Already there are app’s not quite working with Leopard which will only be fixed after the release of the new OS, not before. The decision not to seed GM didn’t stop piracy either as the leechers have been able to download it since Tuesday. One week to go until Leopard is launched for the Mac. I shouldn’t really but I’m considering popping along to the Glasgow store after 6 next Friday to pick up my copy. If I don’t get it then it will probably on Sunday with Shakeel who’ll be up for the weekend. It’s odd – never looked forward to Windows O/S launches this much. 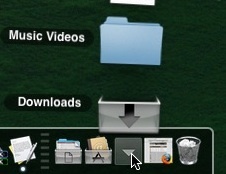 The Finder improvements look to be welcome along with the small improvements to Mail, Address Book and iCal. Spaces and Time Machine look useful too although there’s some smaller things that caught my eye like using expose to turn off the display and stacks to quickly get to common files and folders. The updated Front Row with new Apple TV front end should be a nice addition. iChat has a ton of new features as well…but I hardly ever use it! However there is quite a bit of fluff in there. Mail Templates look like all that was wrong with Outlook stationary and extra photo booth settings aren’t really my thing. The big question – how to upgrade. Take the easy route and install on top or format and start fresh. I’ll probably choose the latter even though it will take a bit more work. If your interested a new guided tour of Leopard has just been posted at apple.com.